Discussion in 'Portfolios Of Famous Investors' started by RAMA MURTHY SASTRY CHALLA, Jul 18, 2016. At a time when high-frequency trading has allowed market participants to transact in milliseconds, India’s best known stock market investor’s average holding period is still measured in years. And his highest returns are on stocks he has held for at least 10 years. A 10-year analysis of 84 companies in which Rakesh Jhunjhunwala has an at least 1% stake reveals that he holds his investments for an average of 3.44 years. He has held his stakes in nine companies, including Crisil Ltd, Titan Co. Ltd and Lupin Ltd, for 10 years or more. He has held stakes in 15 others for between five and 10 years. And he has held his stakes in 65 out of 91 investments for at least a year. In comparison, the average holding period for diversified equity mutual funds has never exceeded two years in the last decade, according to data from fund-tracker Value Research. The minimum was 0.93 years in September 2009, just after the outbreak of the global financial crises. The peak was 1.92 years in March 2015. There is a caveat to this analysis of Jhunjhunwala’s holdings: Information is only available for companies in which his stake exceeds 1%, and is therefore mandatorily required to be disclosed. The analysis looked at 84 such stocks. There are also companies in which he bought and sold his shares, only to buy again later. These were counted as separate investments, with returns being calculated for each entry and exit. The total number of investments thus comes to 91. The analysis does not consider parts of his portfolio about which information is not publicly available. It can therefore only be considered indicative and not necessarily representative. Jhunjhunwala declined to comment for this story. 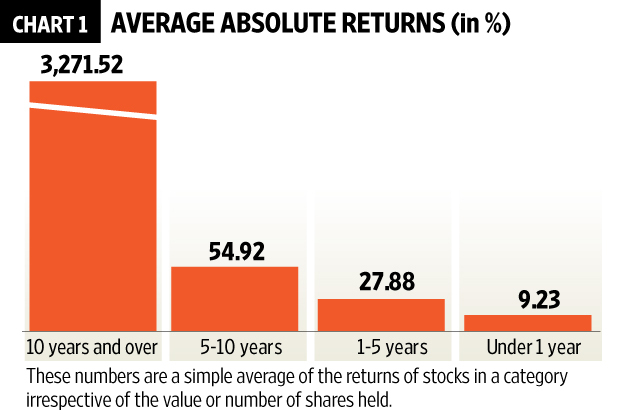 The analysis shows that his average returns have been highest from the stocks he held the longest. His average absolute return on stocks he held for at least 10 years was a staggering 3,271.52%. And his average return on stocks he held for less than a year was 9.23% (chart 1). These returns are a simple average of the returns of stocks in his portfolio irrespective of their weight in the overall portfolio. The 3,271.52% return figure is owing to multibaggers such as Lupin (13,855.7%), Crisil (5,588.6%) and Titan (8,272%) which Jhunjhunwala spotted early on. Not all long-term holdings have been a success though. Share prices of Viceroy Hotels Ltd and Bilcare Ltd are now lower than what they were a decade ago (see chart 2). “In the long run, stock markets in general have been seen to move in an upward direction. Therefore, the longer you hold on, the probability of superior returns is quite high,” said S.S.S. Kumar, a professor at the Indian Institute of Management, Kozhikode. Indeed, the S&P BSE Sensex has risen from a notional value of 100 in 1979 to a high of 30,024.74 on 4 March 2015. 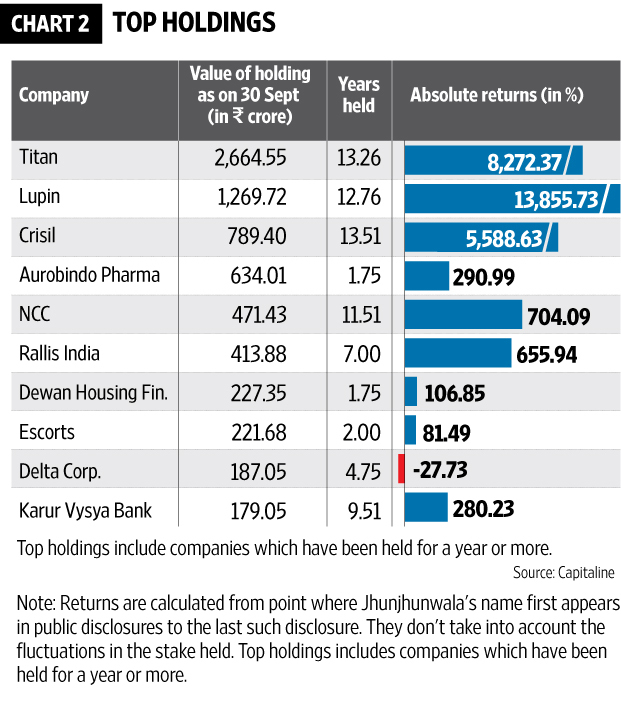 This tailwind certainly helped Jhunjhunwala’s longer-term holdings. Returns were calculated based on the difference in prices between when Jhunjhunwala’s name first appears as a shareholder in public disclosures to the point at which it is no longer present. Smaller holdings for which disclosures have not been made are excluded. 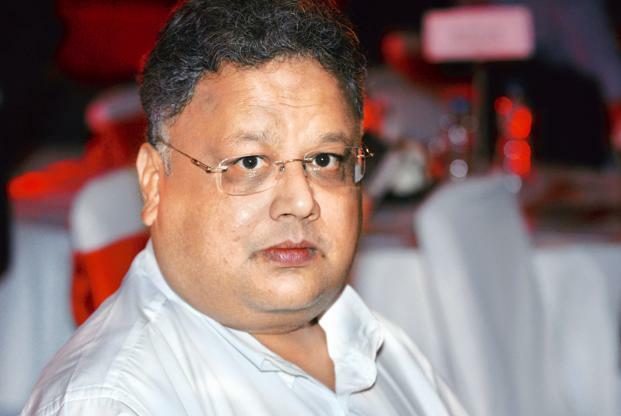 Jhunjhunwala held his stake in 44 companies for at least two years. This is more than half the companies under consideration. This is an interesting contrast to Warren Buffett, CEO of Berkshire Hathaway Inc. and one of the world’s richest investors, with whom Jhunjhunwala is often compared. Buffet is known for holding some large bets for many years. However, researchers who examined his periodic disclosures from 1980 to 2006 discovered that he held most of his stocks for approximately a year. He held his stake in only a fifth of the companies for at least two years, according to the study entitled Overconfidence, Under-Reaction, and Warren Buffett’s Investments by John S. Hughes and Jing Liu from the UCLA Anderson School of Management, along with Mingshan Zhang of the Hong Kong University of Science and Technology. One must keep in mind that the study looked at Buffet’s entire portfolio, while we have access only to Jhunjhunwala’s publicly disclosed bets, which are probably only his large, long-term bets. Jhunjhunwala’s three biggest publicly disclosed bets are all more than 10 years old. This includes Titan (Rs.2,720 crore), Lupin (Rs.1,270 crore) and Crisil (Rs.789 crore). This accounts for more than half of his declared portfolio of Rs.8,663.33 crore, according to September quarter-end disclosures. His top sectoral bets include pharmaceuticals, information technology and computer-related companies, construction and auto and auto ancillaries in the September quarter. Tadit Kundu, Ashwin Ramarathinam and Ravindra Sonavane contributed to this story. jagdish.moga and w4wealth like this. that's really a big achievement for him. Pumping investment of FIIs is always welcome but it makes economy highly dependent on the cash flow as well. This could be point of concern for any economy. Majority of trades should have domestic dependency where they could help the market to give proper direction whenever needed. Couple of weeks earlier Indian ace investor Mr. Rakesh Jhunjhunwala said in an interview to stop treating FIIs as Son in Law. This is true as well. he is really a genius person. Good work!! really a big achievement achieve by him. Where Are Rich Indians Investing Their Wealth? Karvy’s Wealth Report Reveals All Secrets!